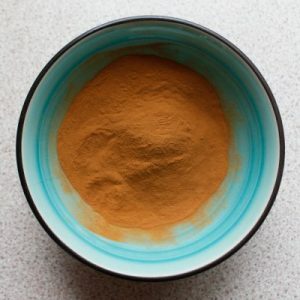 Reishi dual extract powder made using high quality organic Reishi. Extracted with hot water and alcohol to create a full spectrum Reishi extract. 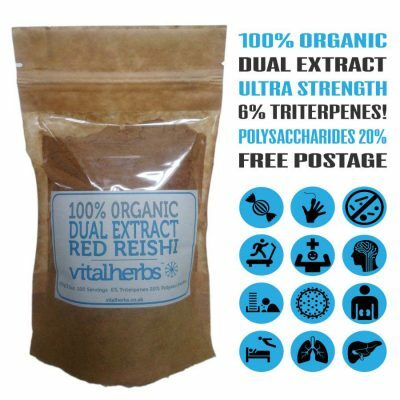 With over 6% triterpenes and over 20% polysaccharides this is a very potent Reishi dual extract. Our Reishi dual extract powder is made from the fruiting body of the duanwood red Reishi mushroom and not the mycelium. 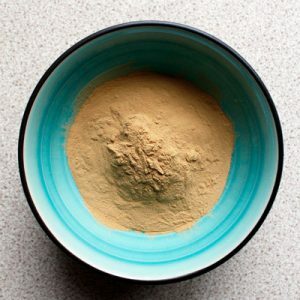 Because of our production method our Reishi dual extract powder contains more of the beneficial beta-D-glucans and ganodermic acids found within the structure of the fruiting body. This extract is very high in triterpenes the component that gives Reishi it’s bitter taste and many of it’s amazing health benefits. We believe in keeping things as close to how nature intended and so all our Reishi mushrooms, prior to being extracted, are cultivated on wooden logs just how nature intended. Dual Extraction. Alcohol and water. 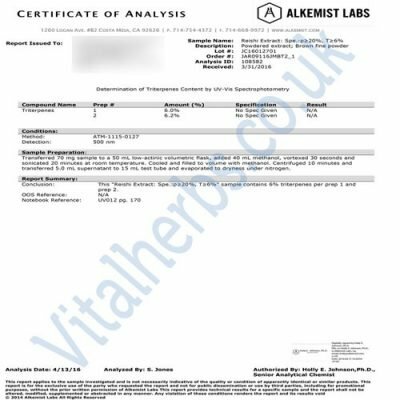 Do not be fooled by quality claims with no analysis to back them up, all our mushroom extracts come with a analysis sheet! Take 1/2-1tsp twice a day before meals. 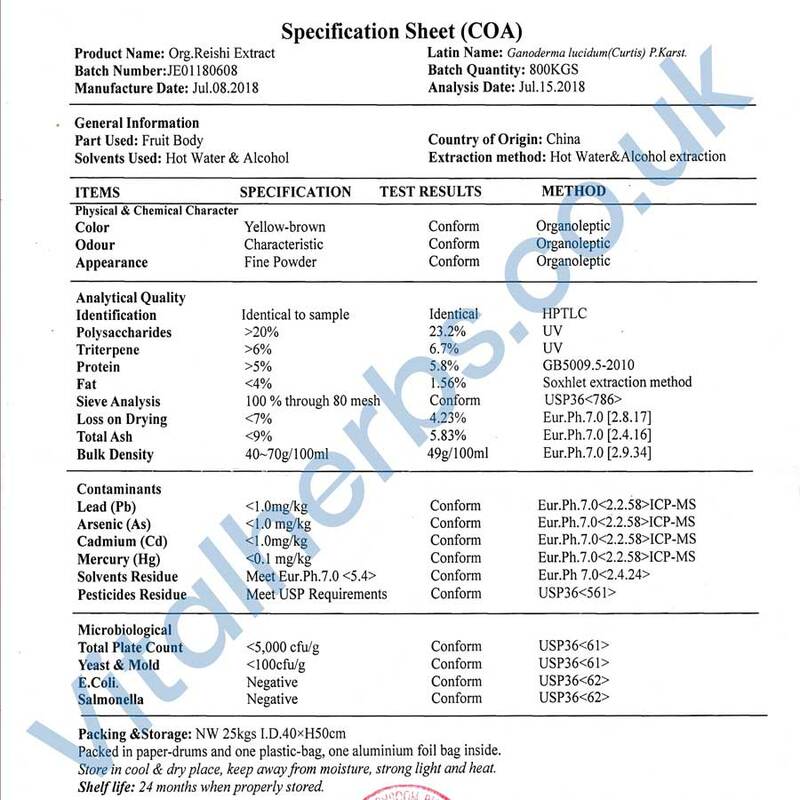 See product images for detailed analysis of our Reishi dual extract powder. 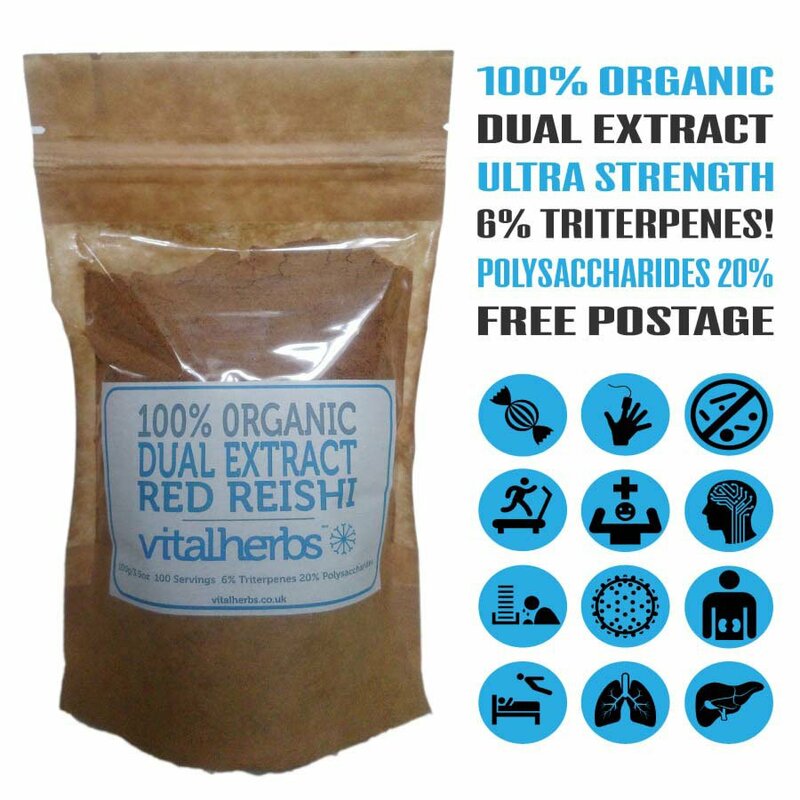 With over 6% triterpenes and over 20% polysaccharides this is a very potent Reishi extract. Because of our production method our Reishi dual extract powder contains more of the beneficial beta-D-glucans and ganoderic acids found within the structure of the fruiting body. Dual Extract. Alcohol and water. Our organic red Reishi is put through a triple hot water extraction, as well as a alcohol extraction. 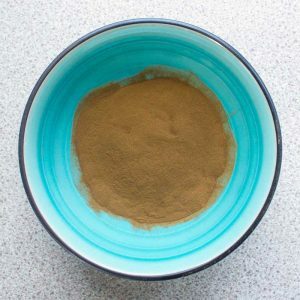 This process makes sure that as many of the 150+ triterpenes and ganoderic acids found in Reishi are released from the raw Reishi powder, to create a full spectrum Reishi extract. From our perspective not all herbal extracts are created equal and we pride ourselves on creating highly potent red Reishi dual extract powder that not only says it’s amazing but can prove these claims. 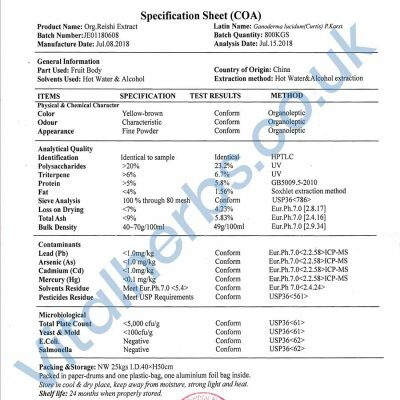 So to back up our claims of purity and strength our Reishi dual extract comes with not one but two detailed analysis sheets. One from us and another third party lab! Reishi mushrooms have a well-known ability to beneficially modulate the immune system. The mushrooms’ ability to boost immunity is the source of their advanced infection-fighting properties. But it is equally important to keep your immune system from overreacting and turning on itself, as is the case with autoimmune diseases such as allergies. Reishi mushrooms have demonstrated the ability to modulate the delicate balance necessary for a healthy immune system. Studies have shown that Reishi mushrooms can reduce the overactive immune response that occurs in conditions such as allergies and asthma. The polysaccharides and triterpenes found in Reishi mushrooms act at multiple targets in the cascade of events leading to inflammation and excessive immune response. Reishi extracts inhibit the release of histamine from specialized immune cells called “mast cells.” They have the ability to reduce the activity in nerves that transmit the itch sensation to the brain after a mosquito bite or similar itchy stimulus. 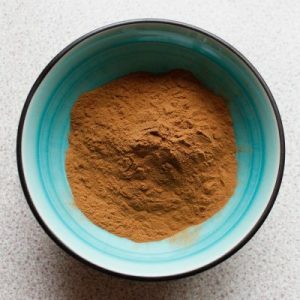 In animal models, Reishi extracts were able to sharply reduce the symptoms associated with allergies, such as rhinitis (watery, itchy nose) and mosquito bites. Studies also show that Reishi extracts can reduce “airway hyper-responsiveness,” the “twitchy” smooth muscle responses in the lung bronchi that trigger an asthma attack. Reishi mushrooms have been the center of many health related studies and if you search online you will find many great articles on the subject, however due to certain laws we cannot mention them here without having our site affected. Vegetarian/ Vegan and Halal friendly! Take 1/2 to 1 teaspoon twice a day before meals. See product images for detailed analysis of our Dual Extracted Reishi extract powder. This extract is quite bitter to taste this is a sign of good quality as the active compound Triterpene makes the Reishi have a bitter taste. If it were sweet it would be because it contained starches from growing on grain. Keep out of reach of children. Consult a physician if you are pregnant or nursing; have or had a medical condition, or are taking any description drugs. If you feel any adverse effects at all, stop taking the product immediately and consult your health practitioner. This is a very good Reishi extract. It comes with a copy of a laboratory analysis. I will definitely order some more as I think the mushroom products are first class. I can thoroughly recommend Vital Herbs. Delivery is very quick and Neal was very helpful. vivid dreams. My energy level is increasing and appetite decreasing! Very well documented product of high quality except that it does not say in which country the reishi mushrooms were sourced. 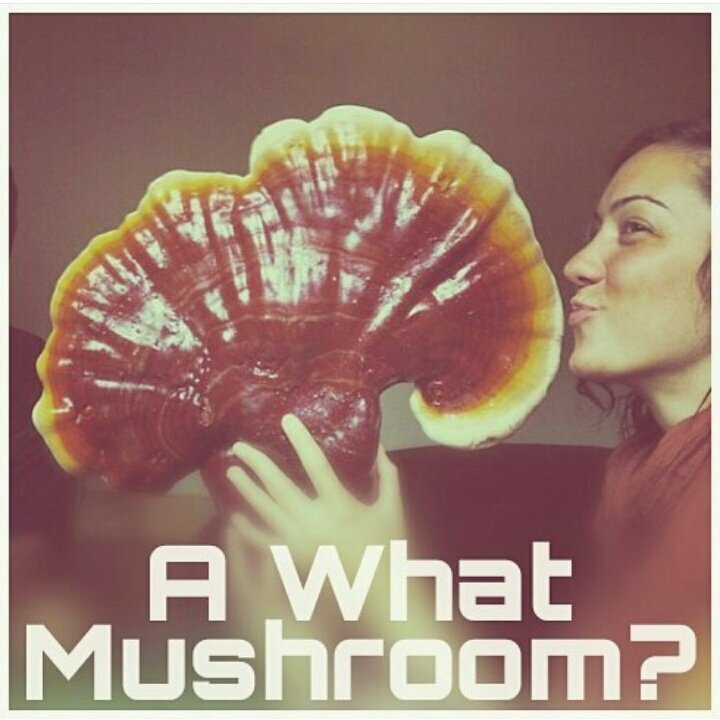 Reishi of very good quality, the best quality of all other reishis tried. Fast delivery time. (6 days to arrive in France) Thank you Vitalherbs. Very helpful and a great service! Product packaging is excellent. The delivery was prompt (5-star for that). However, delivery rate does not equate with product quality. It’s too early to make any comment on the product itself. It takes some time to feel the effect. So please give your customers a fair amount of time (weeks at the very least, not a few days) before pushing for reviews. Glad to see products like this available through your company, nonetheless. Glad you receieved it quickly though take care and thanks for the review if a little early! This is the second time I purchase this product. It seems there’s a batch difference between this one and the last which I got a couple of months ago. The solubility in hot water is not as high this time, leaving quite some solid residues behind (I do weigh out the powder every time). The taste is also more bitter. Not sure if that means a more potent “dual” extract. The packaging is compostable, so I would highly recommend transferring the powder to another container upon receipt. Otherwise moisture can get into the powder over time, even when kept in the cupboard. I have been using reishi mushroom ,from vitalherbs,for a few months now, a friend made it into capsules for me, but recently I bought my own and will continue to do so. I’m feel literally more vital. This has worked wonders, with my health overall. I feel alive and my body is so relaxed in daily activities, less stress is the best way to put it. This is the effective reishi product I had been looking for. For deep relaxation, accompanies an evening ritual beautifully for example. Ideal for very anxious individuals such as myself, and heart-opening too. Really impressed by the availability of lab test results with these mushroom products. It’s really important to know what you are consuming when it comes to herbs & supplements. I made a delicious hot cacao with the dual extract Reishi which will now become part of my night time / health promoting routine. 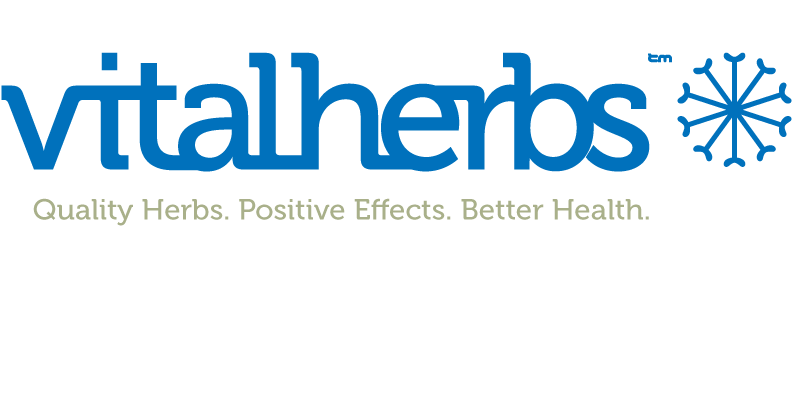 If you are unsure of which medicinal mushroom vendor to go for, I would recommend Vitalherbs, due to their high quality, integrity and professionalism!